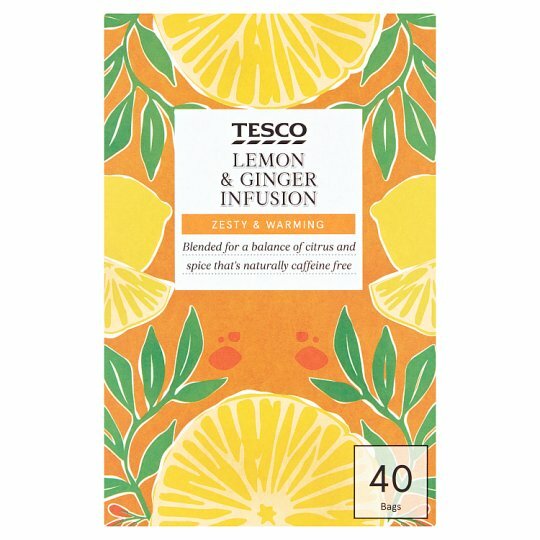 Lemon & ginger flavour infusion bags. INGREDIENTS: Ginger (38%), Apple Pulp, Flavourings, Rosehip, Lemon Peel (3%), Lemon Grass. Store in a cool dry place and once opened in an airtight container. Making your perfect infusion:1. Use one bag per person per cup.2. Boil freshly drawn cold water and pour the water the moment it boils.3. Infuse for about 3 - 5 minutes according to your personal taste.4. Serve without milk.